An amygdala derailment or hijack is when we have an immediate and overwhelming emotional response to an event. An amygdala derailment or hijack triggers a “fight-or-flight” response in our brains which takes over control from our logical rational faculties. 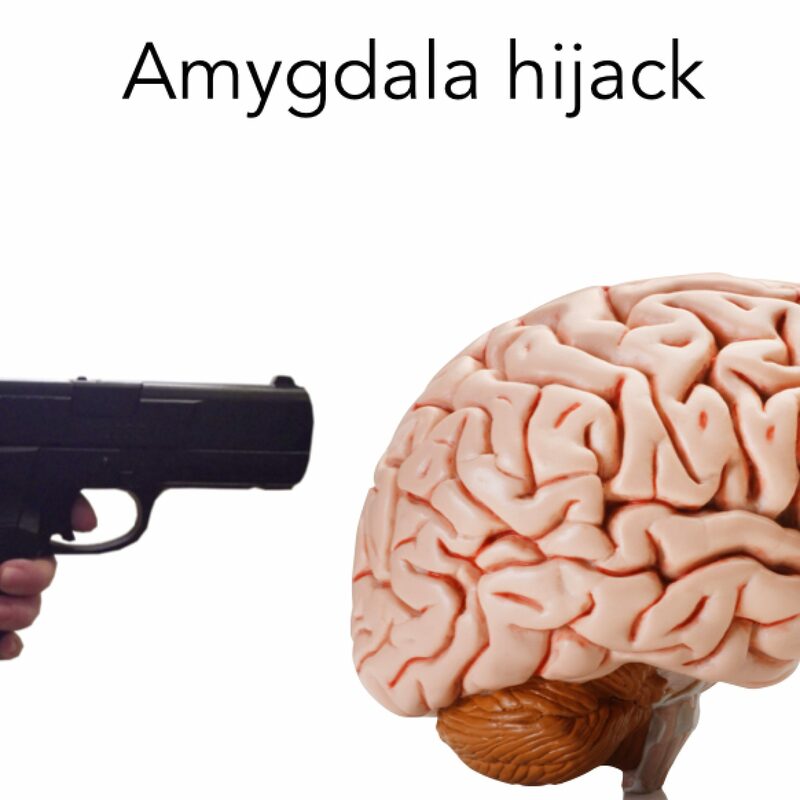 Dr Daniel Goleman (Emotional Intelligence) coined the term amygdala hijack based on the work of neuroscientist Joseph LeDoux. Their research shows how under normal circumstances we process information through our neocortex (our thinking brain). The neocortex then routes the information to the amygdala (deep in the centre of our emotional brain). Sometimes there is a short circuit and our “thinking brain” is bypassed and the signals are sent straight to the “emotional brain.” After this overwhelming emotional response (out of proportion to the event) the information is relayed to our logical brain, causing us to realise the inappropriateness of our original emotional response. 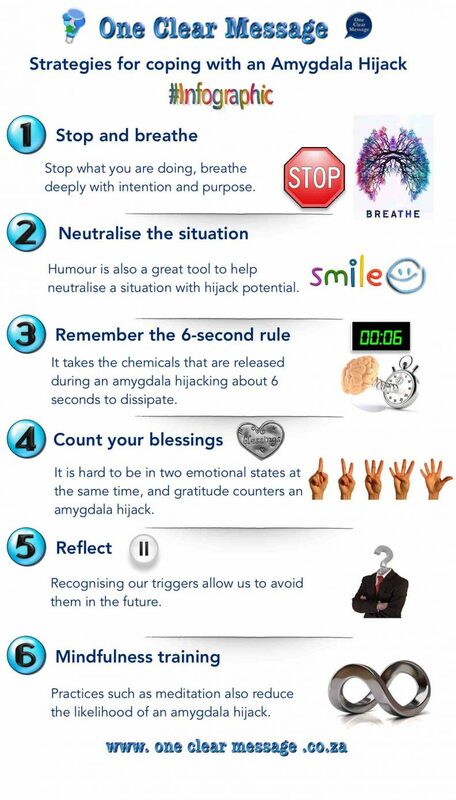 Emotional Intelligence training gives us tools to help manage these amygdala derailment situations. 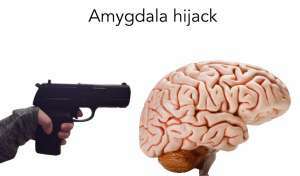 What causes an amygdala hijack? Many thousands of years ago this type of dramatic emotional response served a purpose. Imagine finding yourself face-to-face with a ravenous, hungry, meat eating creature looking for a snack. 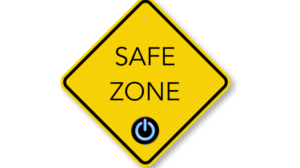 In this dangerous situation our brains wastes no time on rationally assessing the situation, but hijacks your brain into a flight or fight response (allowing us to get out of there). Fortunately today we are unlikely to encounter blood-thirsty beasts, but we do encounter drivers that cut us off, annoying colleagues, misbehaving children, and numerous other situations that may lead to an occasional amygdala hijack. Stop and breathe. Stop what you are doing, breathe deeply with intention and purpose. 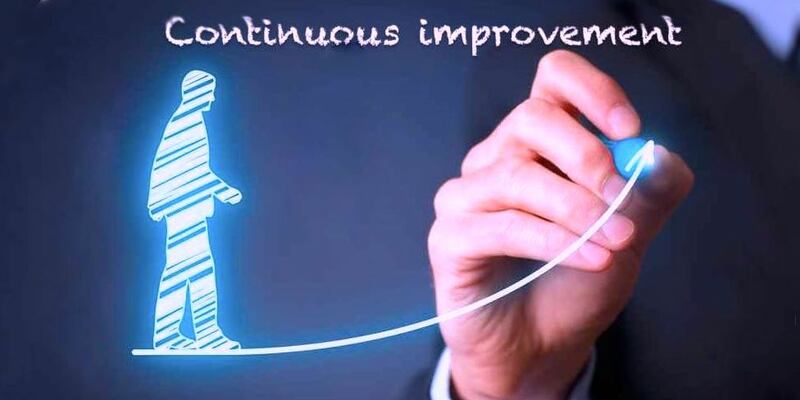 Ask yourself what just happened, replay the comments in your head – this process keeps our neocortex (thinking brain) engaged and can prevent the amygdala fully taking over. Neutralise the situation. When rudely interrupted, remember a time you interrupted someone else (realising we have done the same). Humour is also a great tool to help neutralise a situation with hijack potential. See the funny side and understand that everyone makes mistakes. Remember the 6-second rule. It takes the chemicals that are released during an amygdala hijacking about 6 seconds to dissipate. Take 6 seconds to take 6 deep breaths or focus on something funny you heard (anything that will help you focus on something else) until the initial overreaction reduces. Count your blessings. It is hard to be in two emotional states at the same time, and gratitude counters an amygdala hijack.It is not always easy to appreciate the person who is the source of your reaction conflict, so focus on other parts of your own life, such as your family and friends. Reflect. 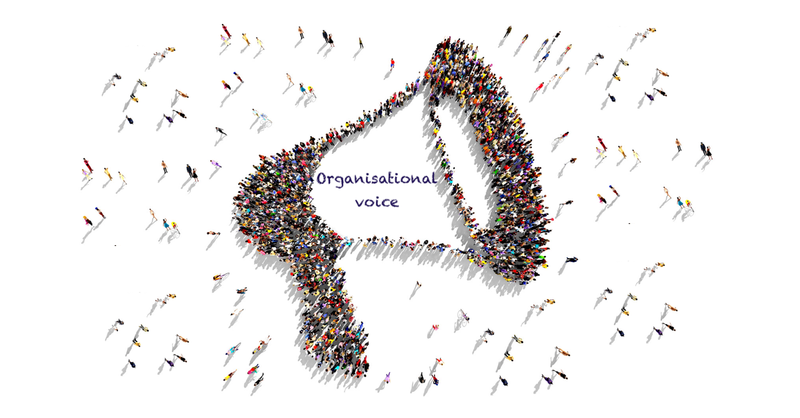 After the event, reflect on the triggers which led to the overreaction, we can learn to prevent those same triggers from causing the same response by storing that information for future use. Recognising our triggers allow us to avoid them in the future. Mindfulness training. 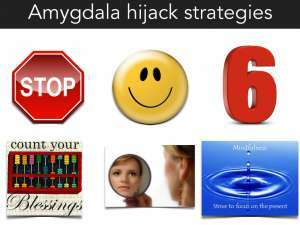 Practices such as meditation also reduce the likelihood of an amygdala hijack.